Quang Vinh is my favourite Vietnamese place in St. Albans. And it looks like a lot of people feel the same way as it's the only place that's buzzing on a Saturday night. I have been there many times for dinner and this time I thought I'd write a post on it. They are very popular amongst the locals. In fact they are so popular, they decided to buy the store next door so they could expand. We like to go early to try to avoid the crowds but it by the time the food arrives at our table, most tables are filled. They have an extensive menu where you can have economical dishes that come with rice or have main dishes that stand alone. Like so many places like this one, the service is not great. However, most times they take the right orders and the food comes out fast. I had the broken rice. It's tasty and the egg is runny. I love this cook book. I've made a few things from it already. I was keen on making hush puppies because I've heard of it many times but didn't actually know what it was or what it tasted like. It's very crunchy and it's moorish. It's quite easy and takes no time to make. This would go really well with a nice cold beer. We had it as a side for dinner. Even though there is beer in the batter, it's not too strong in it. It's perfect for children as all children love crunchy finger food. 1. Put the cornmeal and flour into a bowl, add your beer and leave to sit for a few minutes. Add the corn, spring onions, cheese and pinch of salt and pepper. 2. Using a fork, mix well. 4. Using a tablespoon, carefully drop spoonfuls of the batter mixture into the oil. 5. Let them fry for about 3-4 minutes, then remove with a slotted spoon, and drain on kitchen paper towel. 6. Serve with a sprinkling of a little sea salt. Best eaten while hot. You can check out previous posts on my 2011 cook book challenge here. 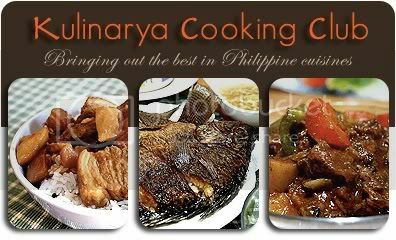 Kulinarya was started by a group of Filipino foodies living in Sydney, who are passionate about the Filipino culture and it's colourful cuisine. Each month we will showcase a new dish along with their family recipes. By sharing these recipes we hope you find the same passion and love for Filipino food as we do. This month's theme is Decadence. For me, anything other than toast or cereal for breakfast is decadent. Firstly, I eat breakfast quickly in between getting both children fed and ready for the day. Secondly, if I do eat, it's pretty boring. I eat just enough to get me through to lunchtime. To have Champorado for breakfast is very decadent for me. Not only it's because it's more than the usual dull cereal but because it's chocolate. Chocolate for breakfast, I recommend it. Champorado is usually eaten for breakfast in Philippines. It's usually accompanied by fried tuyo (salted dried fish). It's stinky but lovely. I opted not to include in my breakfast. It really does stink out the house when you cook it therefore I am forbidden to cook it indoors. The only option was to cook it outside but I wasn't brave enough to face the cold. 1. In a pot, add the glutinous rice and water. Boil till the rice is tender and most of the water has been soaked up by the rice. 2. Combine the sugar ad cocoa powder in a small bowl then add to the rice. Stir to combine. 3. Add the dark chocolate. 4. Stir and leave on gentle bubble till the chocolate has melted and it has thickened. 5. Serve with a drizzle of evaporated milk on top. You can check out what the other members of the Kulinarya club made for this month's theme here. Homemade Cornick. An International Incident Party. Filipino Dumpling Soup and Deep Fried Dumplings. An International Incident. Copyright Cherrie Moore 2010. Theme images by Jason Morrow. Powered by Blogger.